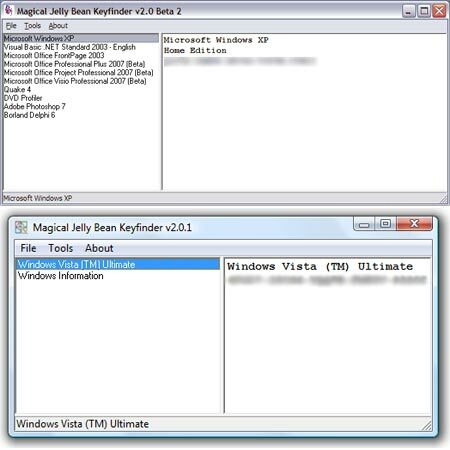 Magical Jelly Bean Keyfinder is an Open Source portable tool that can be used to find the Windows CD Key or Product Key used to install Microsoft Windows products. It retrieves the Windows product CD Key from registry and allows you to print or save the keys for safekeeping. Magic Jelly Bean works on Windows 95, 98, ME, 2000, XP, Vista, Server 2003, Server 2008, Office XP, Office 2003, and Office 2007 family of products. The key finder can also be used to find CD Keys from another Windows Directory or Hive, giving a user the ability to retrieve product keys from even an non booted Windows installation.